This work studies a narrative devoted to the history of the Kokand Khanate, a state that played a great role in Central Asian history in the 18th and 19th centuries, controlling territory equal to continental western Europe, until it was conquered by the Russian Empire in 1876. This unique manuscript, discovered by the editor in Tashkent, is a biography of Alimqul Amir-i Lashkar, Commander-in- Chief of the Kokand army and de facto ruler of the Kokand state in 1863-1865, who died in battle at the age of thirty three. Shortly after his death, Tashkent was captured by Russian troops. The author of this biography was an intimate friend of Alimqul and was actively involved in politics. 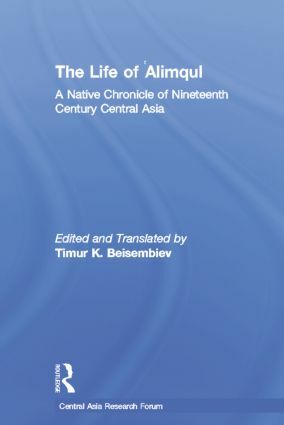 Includes rare reproduction of Chagatay Turkic text.